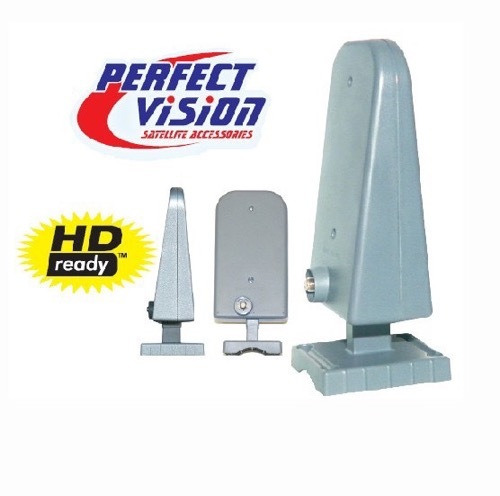 Please check out our HD UHF VHF Antenna Section for similar products!!!! The Perfect Vision A-15 Smartbox Active Terrestrial Digital UHF/VHF TV Antenna is the perfect addition to your high definition satellite system. It offers unmatched range reception based on comparable TV antennas. The A-15's size makes it a virtually unnoticeable addition to your current satellite dish system. Ever lost your satellite TV signal? The A-15 Smartbox Antenna can help! The revolutionary design offers local high definition TV signal when your satellite system isn't working. It receives local off-air TV signal broadcast from your local TV affiliates. Then the antenna sends that signal down to your high definition TV for easy viewing. The A-15 Active Terrestrial HDTV UHF/VHF Smartbox TV Antenna offers a simple solution to a simple problem. Please Note: This TV antenna Does Not receive satellite dish television signal. It is designed to receive local off-air HDTV TV broadcasts.